What's the right way to fold fitted sheets? What's the best way to fold towels? Folding towels and sheets is an underrated skill. We all do it but usually not well. When done right, it's a thing of beauty. Neat folding is easy and brings instant satisfaction. Here are the most important tips. 1. Pick the right place. Fold on a large, cluttered surface to make the process less frustrating. Folding on your already made bed or on the empty dining room table is best. 2. For bath towels, fold into thirds, then half and half. 3. For hand towels, fold into thirds and then half. 4. For washcloths, fold into thirds and then half. 5. For a fitted sheet, do it standing and fold the right corner over the left corner of the short side. Rotate the sheet so your right hand replaces the left and the left moves down the elastic to the formerly bottom corners. With the elastic on top fold the right over the left again. Smooth the sheet down on a flat surface and fold into rectangles until it is the right size. Anything worth doing is worth doing right, right? You'll feel like a pro and will love how the closet and drawer looks. You'll impress your guests. Master this now and it's good for the rest your life (until you buy that robot to do the chores). First choose a place which will facilitate unencumbered folding. Make sure it is large and uncluttered. Folding on your already made bed or on the empty dining room table is best. Folding in the air or on coffee table is frustrating. 2. Fold it into long thirds. 3. Fold it in half and half again. 1. Stand and hold the sheet by the two adjacent corners of one of the shorter edges. Put one hand in each of these two corners. 2. Bring your right hand to your left, and fold the corner in your right hand over the one in your left, enveloping it. Keep your left hand there and hold the folded edge with your right. Shake the sheet a little to let the bottom fall better. 3. Turn long sheet horizontal replacing your left hand with your right and sliding your left hand along the elastic to the corner which was previously at the bottom. The elastic should be facing up and the folded side on the bottom. 4. Again, bring your right hand to your left, and fold the corner in your right hand over the one in your left, enveloping it. 5. 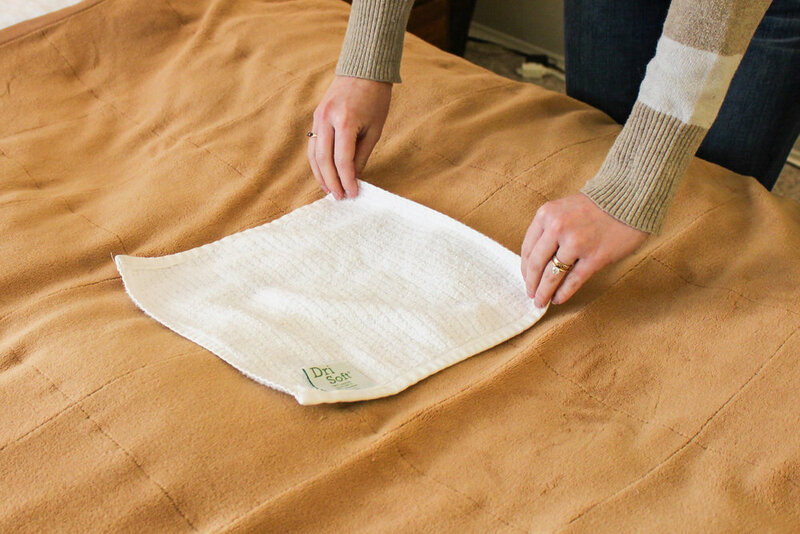 Lay the folded sheet down and smooth it down as best you can. 5. Fold the two edges to hide the elastic. 6. Fold the sheet into a rectangle and continue folding until you get the size you want. The fitted sheet is the by far the hardest but if you do it a few times you will get the hang of it. 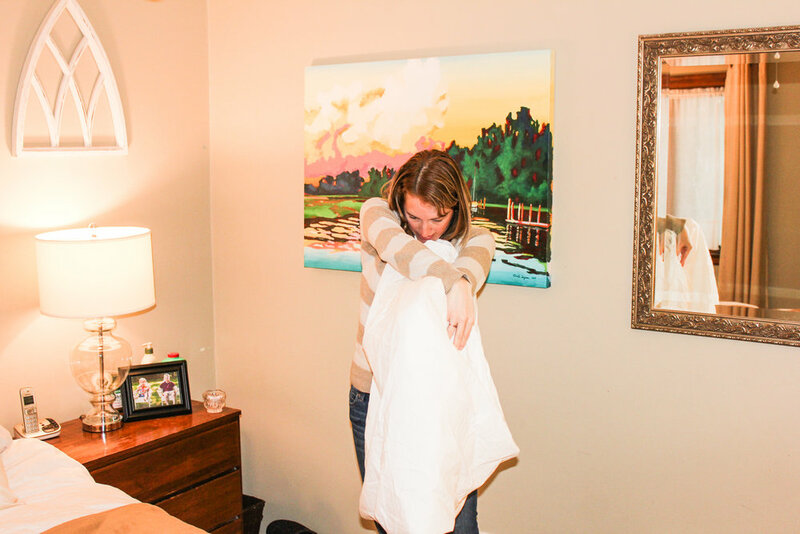 Take out all the sheets in your linen closet and you'll be a pro by the time you get through it all. Repetition is the key. This is the before and after of my linen closet. My closet is deep and I really like it tidy! During this exercise I realized I could get rid of two sets of sheets and put them in the donation bag. The reduction in volume has made the shelf much more manageable. Great video that demonstrates how to fold towels to fit on the shelf. 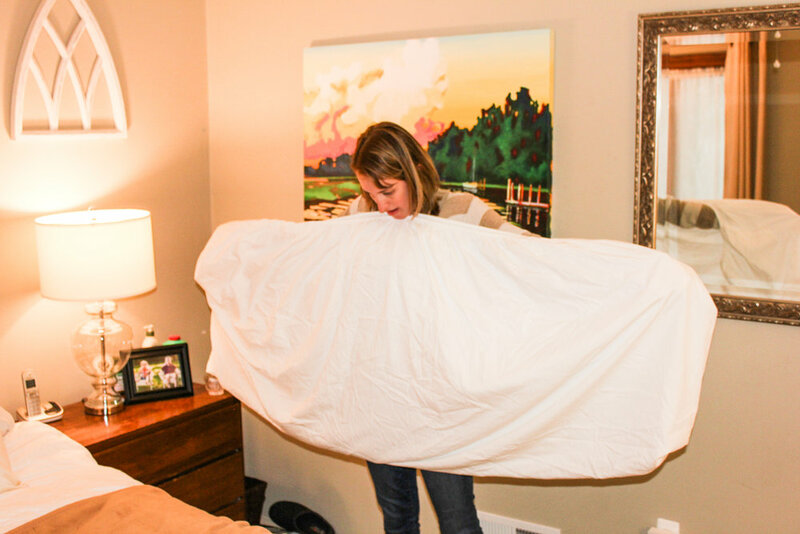 Great video that demonstrates how to fold the fitted sheet with a little humor mixed in. You can definitely do better than the audience volunteer! Perfect pictures to understand each step of folding sheets for the fitted, top, and pillowcases. She includes four options to store.